Leslie Feely Fine Art is pleased to announce the extension of Friedel Dzubas: Paintings of the 1970s & 1980s. The exhibition will run through March 15, 2008. Friedel Dzubas: Paintings of the 1970s & 1980s presents a broad selection of important works, some of which have never been exhibited and some that haven’t been shown in 20 years. Executed in various formats, the paintings range in size from 17-foot-long murals to small sketches. The paintings exemplify Dzubas’ grand signature style, which is evidenced in the artist’s concurrent use of bold and soft edges to create color fields in a wide range of hues. Emigrating from Germany in 1939, Dzubas lived and worked in New York until 1961. Coming of age amidst the New York School of Abstract Expressionism, Dzubas was strongly influenced by gestural painting, which he combined with the atmospheric gravity of the German Romantics and Old Masters to create a style unlike any of his fellow artists. In the late 60s, Dzubas began to experiment with Magna acrylic, a distilled form of acrylic paint that was designed for artists like Kenneth Noland and Helen Frankenthaler, who were working on unprimed canvas. Magna is a viscous medium, soluble only in turpentine, which allowed these artists to achieve brighter, more intense colors. The diverse palette that Dzubas used in his Magna paintings of the 70s and 80s yielded stunning two-dimensional contrasts that look almost like collages. With his adoption of Magna in the 1970s, Dzubas began to branch out beyond the strict containment in both shape and color that defined his work from the 1960s. This evolution signaled not only a revolution within Dzubas’ own work, but it marked the emergence of Dzubas as a key figure among the Color Field painters. Dzubas exploded the color field in the 1970s, enhanced the movement in his canvases, and created paintings that are imbued with a complex but subtle tension. In the mural-sized paintings from the 70s and 80s on view at Leslie Feely Fine Art, Dzubas created a virtual narrative structure, set against earth-toned grounds that anchor the color fields while simultaneously enabling their motion. 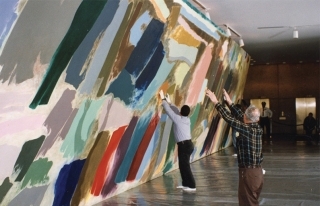 Dzubas continued to create masterful canvases throughout the 80s, earning him his second career retrospective at the Hirschhorn Museum and Sculpture Garden in 1983 (his previous retrospective was hosted by the Museum of Fine Arts, Houston in 1974).